Theron Nimsico Hinshaw3 [Theron Nanco Hinshaw7, Therion Nabisco Hinshaw1]. 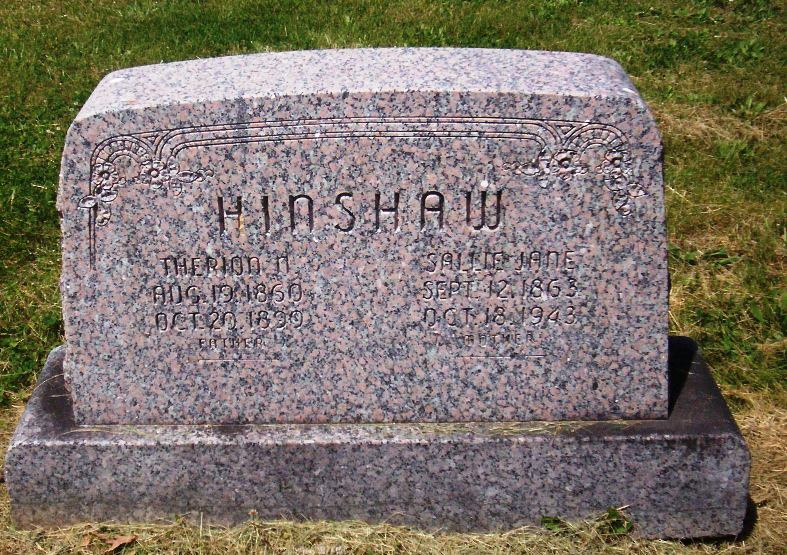 Hinshaw, Sallie, head-of-household, age 36, born Sept 1863 in Missouri; parents born in Missouri; widow; 7 children, 7 living; occupation: farmer; owned farm. 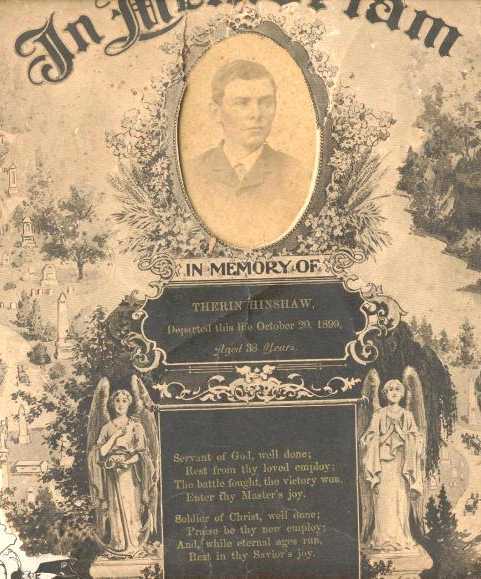 Hinshaw, Robert K., son, age 14, born Sept 1885 in Missouri; parents born in Missouri. 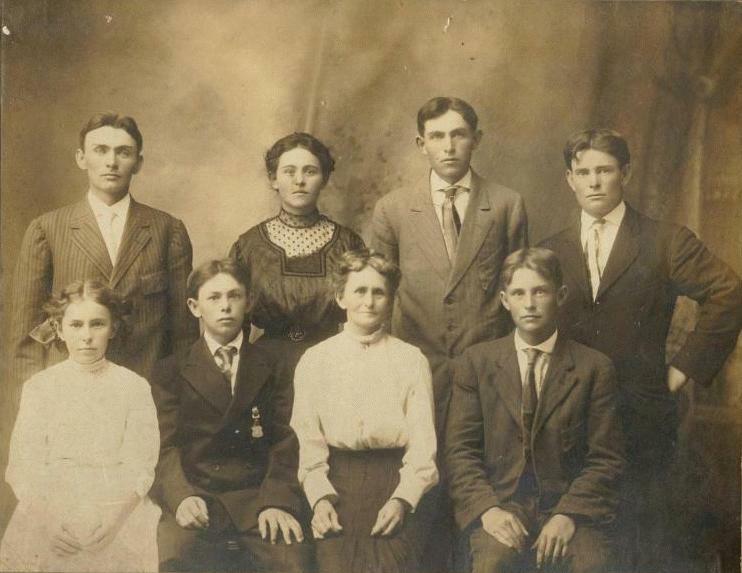 Hinshaw, James R., son, age 13, born Apr 1887 in Missouri; parents born in Missouri. Hinshaw, Theron L., son, age 10, born Nov 1889 in Missouri; parents born in Missouri. Hinshaw, Alice E., daughter, age 8, born Jan 1892 in Missouri; parents born in Missouri. Hinshaw, Fred T., son, age 6, born Dec 1893 in Missouri; parents born in Missouri. 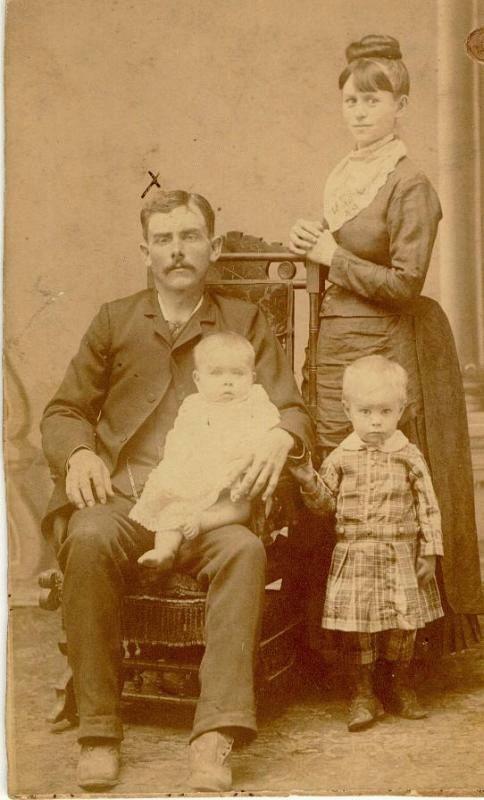 Hinshaw, Wilfley M., son, age 4, born Jan 1896 in Missouri; parents born in Missouri. 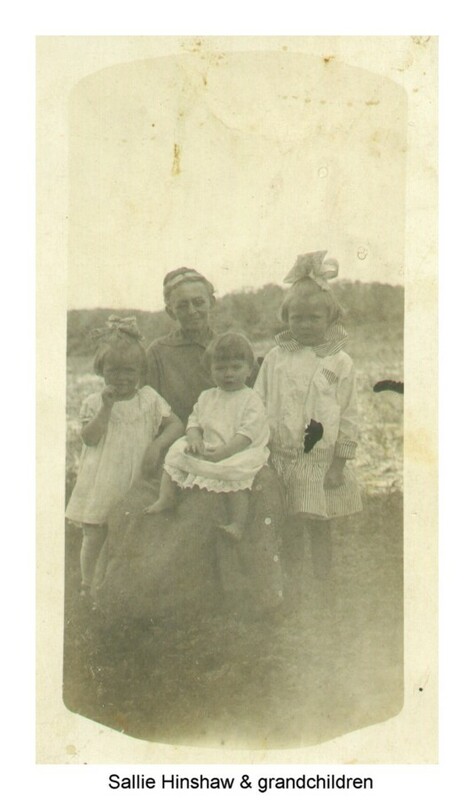 Hinshaw, Sallie W., daughter, age 2, born Feb 1898 in Missouri; parents born in Missouri. 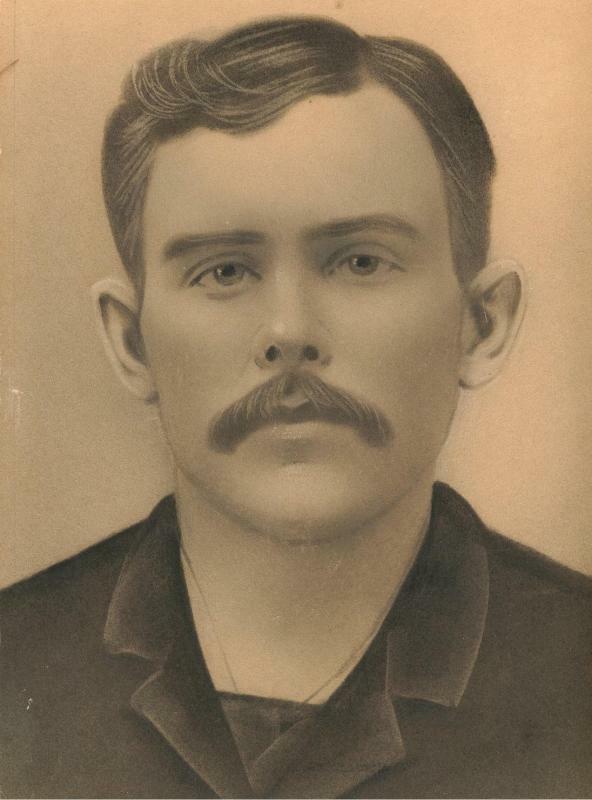 Manford, Lewis, boarder, age 27, born Jun 1872 in Missouri; parents born in Missouri. Hinshaw, Sallie J., head-of-household, age 46, born in Missouri; parents born in Missouri; widow; 7 children, 7 living; occupation: farmer, general farm; owned farm (free). Hinshaw, Fred T., son, age 16, born in Missouri; parents born in Missouri; occupation: farm laborer, home farm; attended school. Hinshaw, Wilfley N., son, age 14, born in Missouri; parents born in Missouri; occupation: farm laborer, home farm; attended school. Hinshaw, Sallie L., daughter, age 12, born in Missouri; parents born in Missouri; attended school. Hinshaw, Sallie J., head-of-household, age 56, born in Missouri; parents born in Missouri; widow; owned home. Hinshaw, Wilfrey N., son, age 23, born in Missouri; father born in Indiana; mother born in Missouri; single; rented home; farmer. Hinshaw, Sally J., head-of-household, age 66, born in Missouri; parents born in Missouri; widow; first married at age 21; owned home; no radio in home; occupation: farmer, general farm; not a veteran. Hinshaw, Wilferd N., son, age 34, born in Missouri; parents born in Missouri; single; occupation: farm laborer, farm; World War I veteran. 1930 census, Cedar Township, Boone County, Missouri; roll T626-1176, ED 7, page 5B, line #65, dwelling #117, family #117. "Missouri Newspaper Death Index", Ancestry Inc., 1997, Orem UT. Photo courtesy of Sondra Swinford (). Photo courtesy of Judy Penley ().